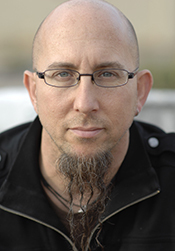 Jeff Coffin is an internationally recognized saxophonist, bandleader, composer and educator who has been traveling the globe since the late 20th century. He is a three-time Grammy-winner as a member of Bela Fleck & the Flecktones, with whom he played from 1997-2010. In July 2008, Jeff began touring with Dave Matthews Band, and officially joined the group in 2009 following the tragic passing of founding member LeRoi Moore. When not on the road with DMB, Coffin fronts his own group, Jeff Coffin & the Mu'tet, and works around the country playing shows and presenting music clinics to students. Artists with whom Coffin has shared the stage and recording studio include a "who's who" of musicians, including Bela Fleck & the Flecktones, Dave Matthews Band, Branford Marsalis, Bob Mintzer, DJ Logic, New Orleans Social Club, Maceo Parker, McCoy Tyner, Baaba Maal, Phish, Mike Clark's Prescription Trio, Galactic, Kirk Whalum, My Morning Jacket, Widespread Panic, Chris Thile, Willie Nelson, Chester Thompson, Garth Brooks, Van Morrison, J.D. Souther, Vinnie Colaiuta, The Dixie Chicks, "Rakalam" Bob Moses, Stanton Moore, Brooks & Dunn, Tuvan Throat Singers – the Alash Ensemble & Konger Ol Ondar, George Porter Jr., Umphrey's McGee, Del McCoury, John Scofield, Yonder Mountain String Band, Marc Broussard, Martina McBride, Lynyrd Skynyrd, the Wailers and many, many others. Along the way, Coffin has absorbed an astounding range of influences. "Whether it be New Orleans Second Line, African, Indian Ragas, Brazilian, folk songs, Gypsy music, Alan Lomax field recordings, jazz, funk, etc," he says, “the spirit and breath of the music is what I take away from the listening and playing. It's what decides for me if I like it or not…I consider it 'Spirit Music.'" Coffin is also known to play two saxes at a time, in a nod to the late great saxophonist Rahsaan Roland Kirk. As a heavily in-demand Yamaha & D'Addario Performing Artist, Coffin has presented more than 300 solo and Mu'tet music clinics from Farmington, Maine to Perth, Australia to Johannesburg, South Africa to students of all ages to raving reviews. Living in Nashville since 1991, Coffin graduated with a music education degree from the University of North Texas in 1990, where he played in the acclaimed One O'Clock Lab Band. He also studied with sax great Joe Lovano on a National Endowment for the Arts grant. A number of Coffin's compositions have been published as big band arrangements through the University of Northern Colorado (UNC) Jazz Press, and he has presented them in concerts with many ensembles. Education continues to be an important part of what he shares with others, and he is a tireless champion to players of all ages and levels to discover and cultivate their own musical voice. At the 2000 Grammy Awards, in addition to Bela Fleck & the Flecktones winning a Grammy for Best Contemporary Jazz Recording for the album Outbound, Coffin & Fleck’s tune "Zona Mona," also from Outbound, was nominated for Best Pop Instrumental Composition. Coffin is also an avid photographer who views photographic composition, musical composition and improvisation as going hand in hand. All of his recent album photography is his own work.